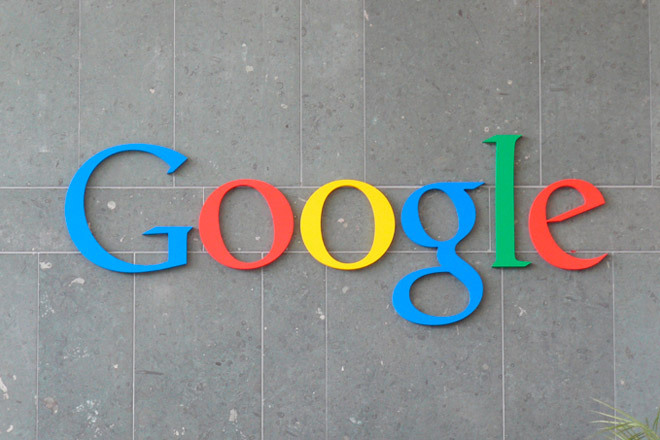 Yet another reason to avoid the talking heads in the financial media! According to a Media Matters review, Payne was paid $40,000 to promote The Brainy Brands Company, “$25,000 by a third party” to promote NXT Nutritionals Holdings, and an undisclosed amount for a “consulting arrangement” to promote Generex Biotechnology Corporate. Payne’s sponsored stock pitches shared a common theme: using his cable news and Fox credentials to assure skeptical investors that his advice was trustworthy. 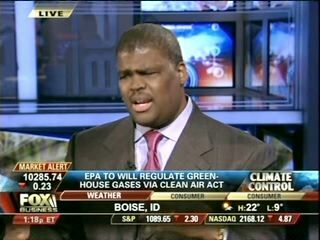 A direct marketing company which worked with Payne stated it brandished Payne’s Fox News connections “to build credibility” with his potential customers. The stock pitches were also used as a vehicle to entice readers to join Payne’s subscription newsletter. “See if refinancing could save you an estimated $4,344 in annual payment savings,” reads the pitch in boldface on a direct mail advertisement sent to a New Jersey borrower last month. The ad compared the borrower’s current mortgage payment on a 20-year fixed-rate loan with an interest rate of 4% to B of A’s “new loan program” that offers a 30-year fixed-rate at 3.75%. B of A showed a breakdown in which the borrower would be paying two points on the new loan, adding an estimated $8,977 in fees and closing costs. That would increase the overall interest rate to 4.1%, excluding taxes and insurance. In short, B of A’s pitch, with its focus exclusively on lowering the borrower’s monthly payment, implied that the deal was in the consumer’s best interest, even though the borrower would end up paying a higher interest rate and would be adding 10 more years to the overall life of the loan. Such tactics are not in a borrower’s best interest and fly in the face of efforts by the Consumer Financial Protection Bureau to make consumer products more transparent, simpler and easier to understand, consumer advocates added. 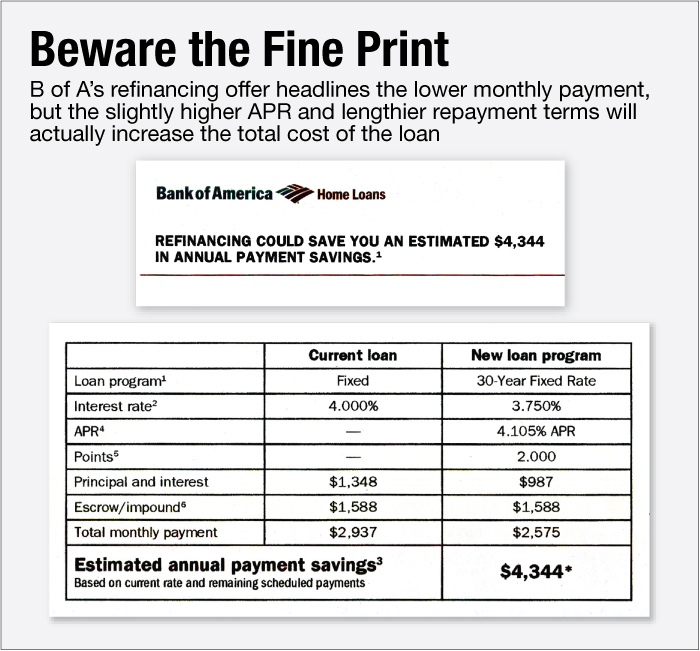 Andrew Pizor, a staff attorney at the National Consumer Law Center, examined B of A’s letter and calculated that the new refinance offer would add $37,188 more in interest over the life of the loan compared to the borrower’s current mortgage. Bottom line: consumer advocates and banking industry officials appear to differ over whether ads such as B of A’s rise to the level of making false or misleading claims. 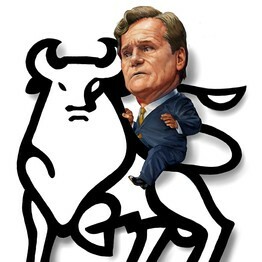 Bank of America Chief Executive Brian Moynihan is looking to squeeze Merrill Lynch’s “Thundering Herd” for more revenue and profit through cross-selling. In the banking business when you try to sell customers additional products it’s called “cross selling”. Banks like BB&T and Wells Fargo have strong cross-selling reputations. For example, Wells Fargo says it sells an average of 6 products to its retail-banking customers. Things get messy when this cross selling breaches the boundary between bankers and brokers. For example, Merrill Lynch brokers’ yearly bonus partially depends on how much money brokerage clients have in checking and savings accounts at parent Bank of America. 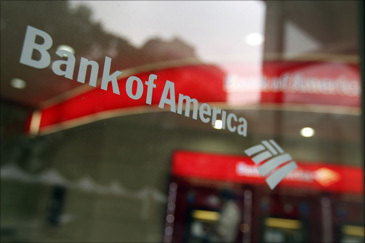 Merrill Lynch brokers and managers complain that this compensation structure essentially puts Bank of America’s own interests ahead of clients since Merrill employees have a disincentive to advise customers to withdraw money from bank accounts. Other Merrill brokers say customer service at BofA isn’t reliable enough for them to feel good about encouraging clients to do business there.